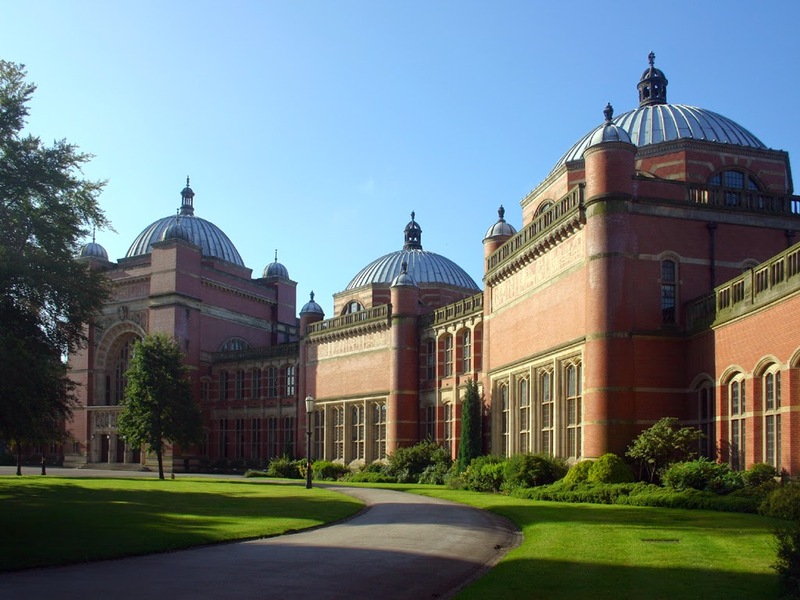 On 8th-9th May Lisa Bortolotti and Ema Sullivan-Bissett hosted a workshop as part of the AHRC-funded project on the Epistemic Innocence of Imperfect Cognitions at the University of Birmingham. Papers were given by Ryan McKay (Royal Holloway), Maarten Boudry (Ghent), Lisa Bortolotti (Birmingham), Katerina Fotopoulou (UCL), Martin Conway (City University London), Ema Sullivan-Bissett (Birmingham), Petter Johansson (Lund), Lars Hall (Lund), Jules Holroyd (Nottingham), and Miranda Fricker (Sheffield). 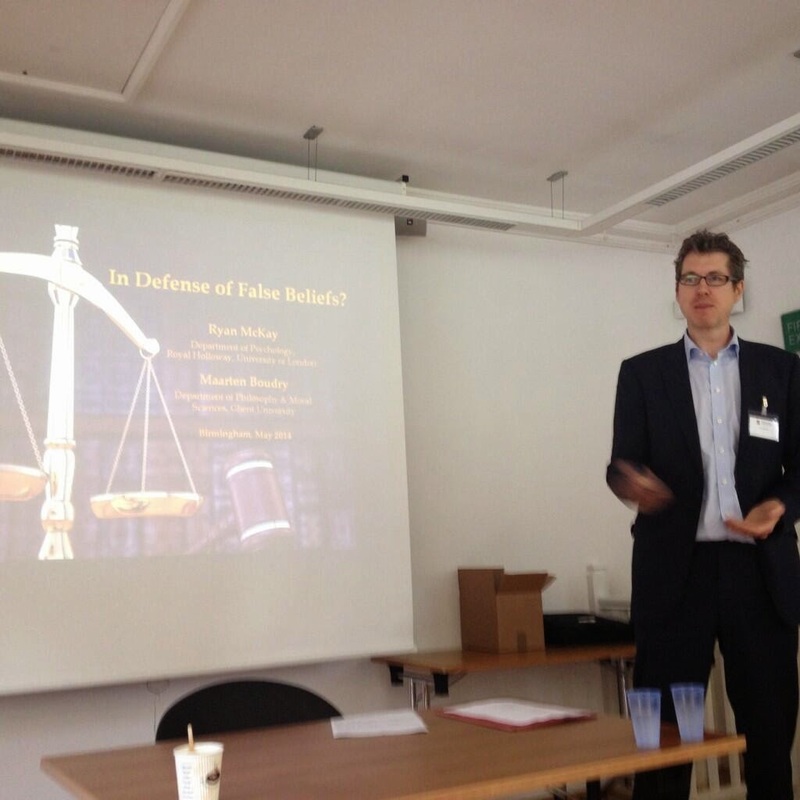 McKay and Boudry opened the workshop with their discussion 'In Defence of False Beliefs? '; they approached the discussion as a mock trial with McKay arguing for the 'defence' and Boudry arguing for the 'prosecution'. McKay argued that there may be social, psychological, biological, and epistemic benefits to having false beliefs and also that they should be considered rational as they seem to be properly responsive to evidence. Boudry countered that although we sometimes tolerate false beliefs these should not be considered rational; because we cannot tell which false beliefs are safe to indulge in and which are harmful, and we still need some people to keep track of the truth of the matter epistemically speaking. 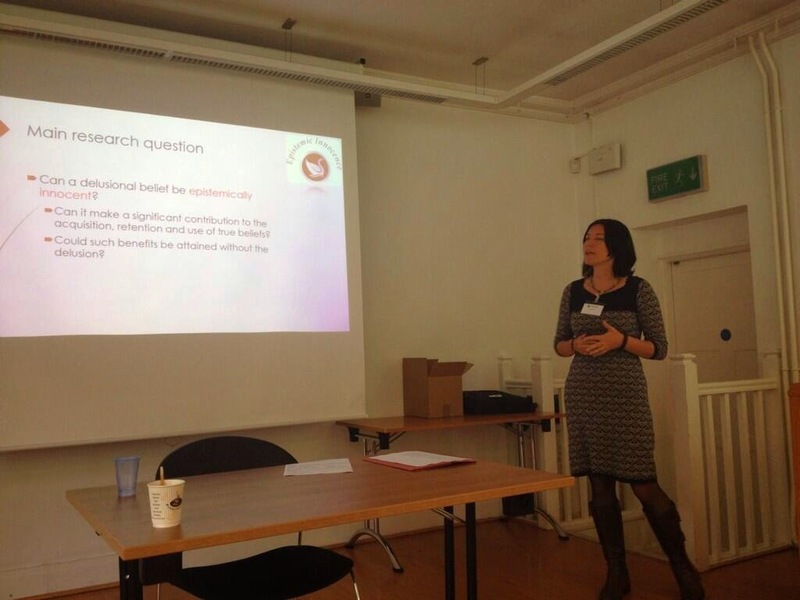 Next, Bortolotti presented a paper entitled 'Epistemic Costs and Benefits of Delusional Beliefs', in which she introduced the notion of 'epistemic innocence' and discussed whether clinical delusions, such as schizophrenia, have the potential for epistemic innocence. She argued that at least some delusions can have temporary epistemic benefits as well as psychological benefits. But she was keen to note that this does not mean that epistemically innocent beliefs are free from epistemic faults, are epistemically neutral, or are epistemically good or justified as a result of her argument. After lunch Fotopoulou gave a paper entitled 'Inferring the Self: Neurological Exaggerations of Normally Imperfect Inferences about the Body', where she discussed how we become aware of ourselves in the world with reference to cases of neurological disorders and clinical cases. She went on to describe how neurological disorders of the bodily self represent exaggerated instances of normally imperfect inferences about one's bodily state and the self. Then Conway gave a paper entitled 'Memory, Reality, and Consciousness in the Remembering-Imagining System', in which he explored recent themes relating to autobiographical memory. He was particularly interested in whether such memory represented reality, and he went on to argue that autobiographical memory represents experienced reality; before turning to discuss the connections between what is remembered and what is imagined. Finally, Sullivan-Bissett closed the first day with her paper on 'The Epistemic Status of Confabulatory Explanations'. 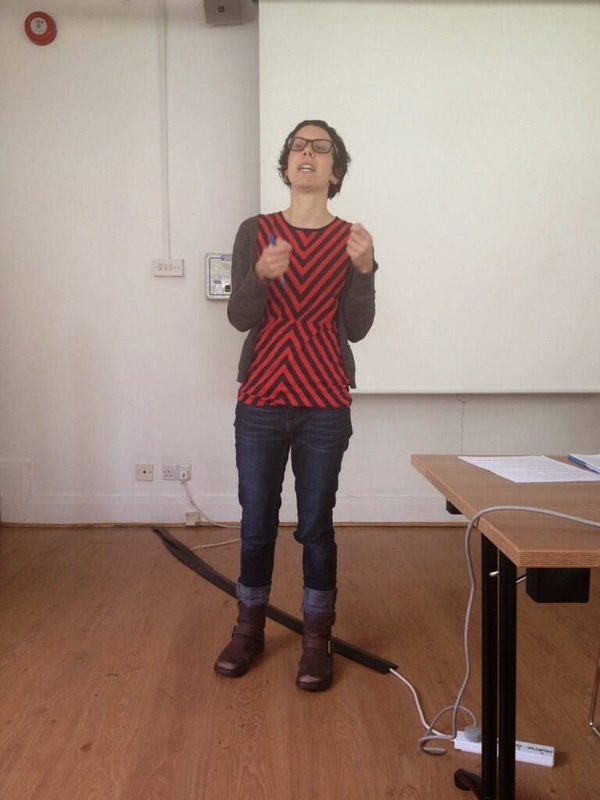 Here she argued that there is a sense in which confabulatory explanations can have epistemic benefits by discussing cases in the clinical population, and various implications for clinical intervention; before explaining that confabulatory explanations as such can be considered epistemically innocent. The second day began with a paper by Johansson and Hall entitled 'Choice Blindness and the Flexibility of Attitude Formation: Why not Knowing why might be a Good Thing'. Here they discussed recent studies involving 'choice blindness' (which was originally inspired by techniques in close-up-card-magic) and moral and political attitudes. They discussed the flexibility of the research participants attitudes and argued that this can be considered a good thing because people seem to be more open to changing their moral and political opinions than had been previously assumed. Finally, Fricker closed the workshop with her paper entitled 'Fault and No-fault Epistemic Responsibility for Implicit Prejudice'. Here she discussed the question of whether there are circumstances where we may be guilty of implicit prejudice and yet not be epistemically blameworthy. She used the example of bad epistemic luck, where there is a space for no-fault epistemic responsibility, which she argued should be considered the epistemic analogue of 'agent regret' as found in normative debates. Overall the conference had a relaxed and engaging atmosphere, with lots of time for productive discussion over the two days. More information about the project, including a full list of outputs and calendar of research activities can be found here and the project Facebook page and Twitter feed can be used to stay in touch with the Imperfect Cognitions network activities. Hi Sarah and thank you for this detailed report! The workshop was fun and I learnt a lot from it. For those who could not attend, most of the papers will be published as part of a special issue of Consciousness & Cognition. Watch this space for details!